Say hello to our new family member! | A Cat Called Freya, and Teego Too! ← Purina gives 20 Pallets of food to Caboodle Ranch! Say hello to our new family member! I know this will have come as a bit of a surprise to you all, since we weren’t looking for a new family member, but there’s a lovely story to his arrival! A couple of days ago, we had a phone call from our friend Lisa from FOAL farm, the rescue home where we got Teego. Daddycat volunteers there occasionally too, and they’re big fans of this blog! 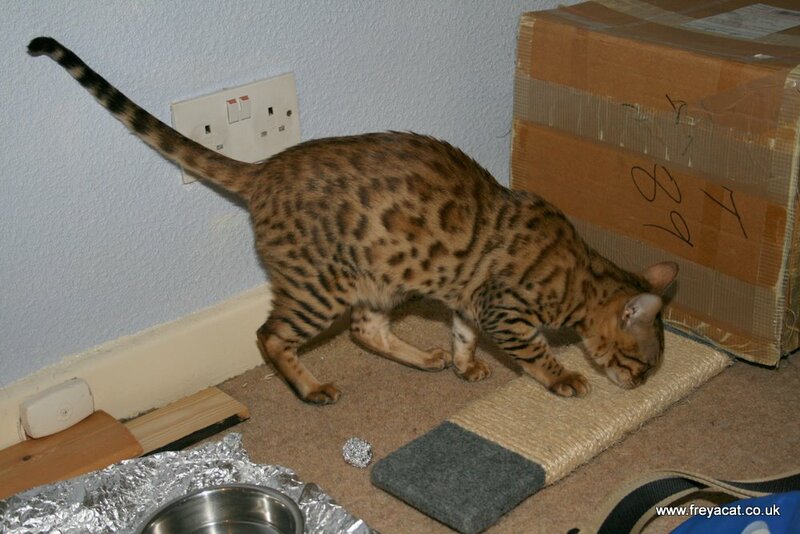 Lisa explained that they had a male Bengal kitten come in and they couldn’t give him out to just anyone, as Bengal cats are a little specialist and can’t be homed with inexperienced cat owners. Makes me feel quite proud to be a Bengal cat! Anyway, the previous owners had bought him as a kitten from a Breeder, but they also had a number of very young children and it was all too much for them with the very young kids and a high-maintenance kitten too! So being responsible people, they took the little kitten to FOAL to see if they could rehome him. Once he arrived at FOAL, he instantly became the talk of the farm, as he is rather striking looking, and he LOVES cuddles! He’s rather vocal too, and calls all the time when he wants attention! 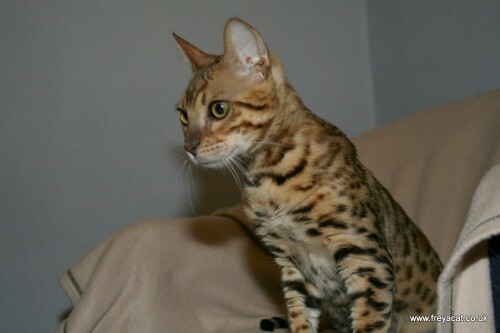 So Lisa called us, knowing that we already had an incredibly beautiful Bengal cat, graceful, intelligent, famous, did I say beautiful already? (Daddycat: HEY! What’s going on! Freya, get off the keyboard!) Lisa knew we already had some old spotty cat, so wondered if we might be interested in another. She emphasised that there was no pressure at all, but we didn’t need to be told twice! The next day we shot over to FOAL, and were bowled over by the little kitten who was then called Banjo. 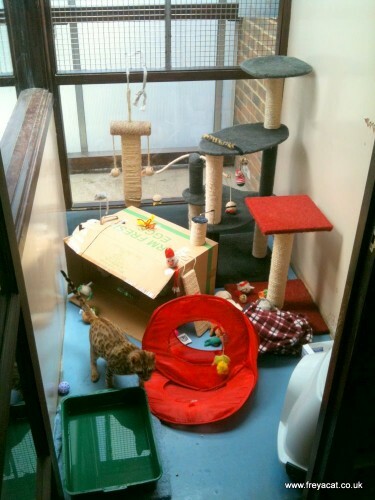 They’d put as many stimulating toys and dangly things as they could into his pen, and the cardboard box is actually his own personal activity centre, that Natasha had custom built especially for him! And what do you think the green thing at the bottom left is? How many kittens in a rescue home have their own swimming pool? Chatzi LOVES water! At his previous home he was always getting into the bath and the sink, and even when we went to see him, his paws and belly were wet! You can imagine, this was an incredible bolt from the blue, but even more amazingly, two days earlier, a friend had been visiting FOAL farm, and seen a beautiful Bengal kitten, taken 6 photos of him, and wondered if the big RESERVED sign on his pen was because of us! We asssured them that we knew nothing about the Bengal! So how amazing that two days later, We should get a call, about the exact same Kitten! I did a video tour around FOAL farm a while ago if you want to take a look at what it’s like there! 37 comments to Say hello to our new family member! oh, what a lovely kitten. I know he will be spoiled quickly…or, even more spoiled I should say. Freya, you are still the most gorgeous baby…don’t ever forget that. Hi Chatzi! Wow, what a story that is! And what a gorgeous boy he is – his spots are amazing! Of course, you know this means you will have to update your header again to add your new brother! And boy, Freya, that is going to make you the only girl in the house with two little brothers – you are going to have your paws full for sure! congratulations on your new addition!! I can’t wait to see what kind of mischief he gets into! Wow, congratulations on your new family member! We’re sure he’ll keep everyone on their paws and toes! He’s Home!! I know he’s one lucky boy! I still can’t believe that we did not think of you earlier especialy as together we looked on you website the night before! Natasha had the brilliant idea whilst making his personalised activity centre (she’s not just a pretty face! )and remembered the floor to ceiling scratching post you built for Freya (Natasha has already passed her work of art to a pair of gingers that are pleased to benefit for their new toy).Its also pleasing that his previous owner was very responsible to ask a rescue centre to take him on because he is a handful, rather than Teego previous owner who was saved by a neighbour before he was going to be bagged up and thrown into a river! Well the fun starts here and we can’t wait to watch your site to see the progress, and Natasha and I excuse you from volunteering for a while because your hands will be certainly full now! I am confident that things will go just fine with Freya and Teego in time because they are just so wonderful and will probably enjoy all the fun too and probably even more spoiling. What a great story!! We are so happy that you all found each other and look forward to hearing all the great new stories!! And we can’t imagine how much of an adventure it is going to be to keep him dry. We are so happy for Chatzi! Welcome home, sweet naughty boy. This is so exciting and we can’t wait to see how the three of you Cats get along. 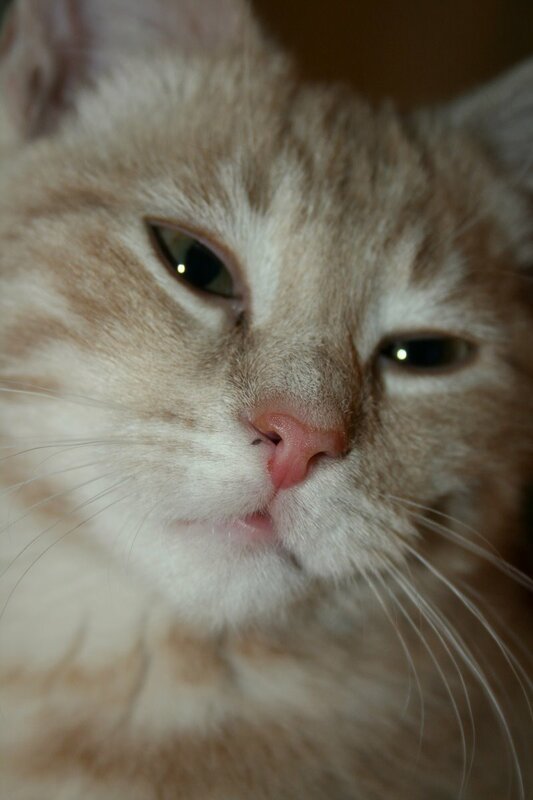 Chatzi is a sweet boy! We know you will make him feel at home just like you did Teego! More Fun to come for sure ! How cool! I am sure he will add lots of excitement to your household, right, Freya? Ooh he looks pretty naughty… Rachel says it’s exciting to have a new kitten in the house but we’re not sure, I hope she’s not getting any ideas! She also says we should be laying bets on how long it takes you to update the blog banner to include Chatzi! Well good on you for saving another kitten but holy cow Freya! Another one? Congratulations on the new addition to your family! Chatzi is gorgeous! How is he getting along with Freya and Teego? I know most Bengals do love water, and I once saw a video of a Bengal cat “fishing” in a tub partially filled with water and a few feeder goldfish. “Some Old Spotty Cat” sounds like a new blockbuster movie to me!! I am excited and a little jealous. HELLO CHATZI… you are one little beauty and you are joining a beautiful family! Here’s a big welcome to Chatzi! What a purrfect name for a chatty kitty! He is absolutely gorgeous, and sounds like quite the character, too. I hope the integration with Freya and Teego goes well. Chatzi will definitely make a good LOL-Cat sometime soon. We’re so glad he has such a loving and understanding furever family. That is so wonderful and Chatzi is one lucky little one!!! We are so delighted to know that you have a lovely new home – we know you will be very happy there. Chatzi!! Awww how adorable!!! He’s gorgeous, absolutely gorgeous!! Yay!!! Hi there adorable and kitten out of the blue Chatzi!!!! You are one lucky kitty to have such an awesome home…and you’re going to have such fun as a part of the CB! Welcome Chatzi, we are looking forward to getting to know you. We has a pond to swim in, but Artemisia and Fenris (our doggie) are the only ones who use it. We thinks Artemisia falls in when she is trying to catch fish but she acts like she meant to go swimming. What a beauty! He sounds like a character, too. I can’t wait to read about Freya and Teego getting to know their new brother. Wow, and concatulations! Welcome to your new home, handsome Chatzi. We know you’re going to love living with Freya, Teego and Daddycat! How neat, a new Bengal. He’s handsome (and yes, Freya, you are gorgeous) and Chatz seems like a good name for a chatty cat. Poor Freya. Now she has to put up with 2 brudders. Poor, poor girl. Only fair thing to do is get another sisser kitty to even out the ranks. Of course, you may want to wait a few months until the furs settle down. Dear Freya, be good to your new brudder. He will love you and play with you if you let him. Of course, feel free to keep him in line with your paw o doom. Welcome Catzi. My, aren’t you a handsome guy! We’re happy you found your forever home with Freya & Teego. AWWwww!!! What a cutie!! We are sure Chatz will get along fine with everyone!! You are so sweet to take him into your home!! Oh boy, yoor gonna get to play queen now! He’s kinda cute. Welcome Chatzi! Oh, please forgive me for identifying Chatzie incorrectly. Coincidentally, the Bengal Trio also adopted a new Bengal quite recently. Her name is Mercy and she looks quite a bit like Chatzie. I have now corrected it on the LOLSpot. Thanks for letting me know. Welcome Chatzi – what beautiful rosettes you have, what a stunner! You are very lucky to live with Freya & Teego & will have a great new life. We are all Bengals too, & can be very high maintenance but also great fun & have really big personalities. We love water too, in fact our mum has given up putting down a water bowl for us as we dragged it across the floor & deliberately tipped it over. We now have a drinking fountain just outside our front door! Three cats is a great number!! Wow, amazingly cute and will no doubt grow to become a real beauty. Stunning!